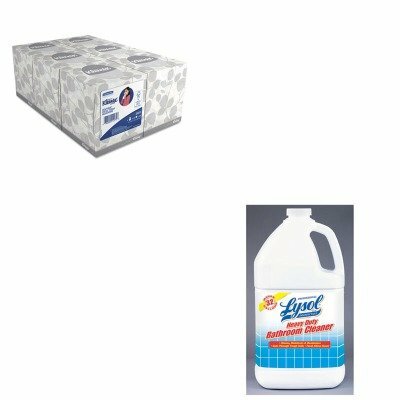 lt;stronggt;RAC94201EAlt;/stronggt;lt;BR/gt;Professional LYSOL Brand Disinfectant Heavy-Duty Bath Cleanerlt;BR/gt;Hospital-type disinfectant cleaner for all restroom cleaning needs. Penetrates tough soils including soap scum and body oils. Concentrated formula makes up to 32 gallons for general cleaning and disinfection. Nonacid, nonabrasive. Application: N/A Applicable Material: N/A Chemical Compound: Diethylene Glycol Monobutyl Ether Materials: N/A.lt;BR/gt;lt;BR/gt;lt;stronggt;KIM21271lt;/stronggt;lt;BR/gt;Professional LYSOL Brand Disinfectant Heavy-Duty Bath Cleanerlt;BR/gt;Soft and absorbent facial tissue. Our strongest tissue packaged for attractive presentation. Special feature lets you know when tissues are about to run out. Tissue Type: Facial Number of Plies: 2 Number of Sheets: 95 per box Length: 8 1/4amp;quot;. View More In Facial Tissues.